Prominent & Leading Wholesaler from Delhi, we offer rotating rectifier assembly and rectifier rotating assembly. The company has managed to carve a niche in the market for the wide range of Rotating Rectifier Assembly which are supplied to the customers using the best technology available in the market. These plates have been made using a high quality of raw materials which have been procured from well known vendors in the market and they have been priced at very affordable rates in the market and they are high on demand in the Alternator industry. 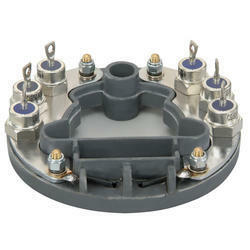 We offer a wide range of Rectifier Rotating Assembly. Looking for RRA Plates ?